Mr Prasad is in charge of General Services at NCAER, which include, among others, all supervisory and managerial aspects of mechanical, electrical, digital, plumbing, HVAC, security, parking, and housekeeping systems, procurement, maintenance, testing, pantry and cafeteria management, assurance, compliance, and trouble-shooting. 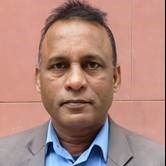 He has worked with Cushman & Wakefield India, Johnson Controls India, Computer Sciences India Corporation, and Shiv Shakti Facilities in the past. Daya served in the Indian Navy for 15 years on shore and on ship before retiring as Petty Officer to join the private sector. He obtained his B.E. in Mechanical Engineering from the Navy, a B.A. (Hons.) in Public Administration from IGNOU, and a diploma in electrical engineering from the National Institute of Engineering, New Delhi.